Do you have many videos on your iPod Touch? If yes, it is important that the presence of many videos on your device could occupy a lot of space on your iPod Touch and may cause your memory to get filled up easily. Depending on the kind of iPod device you use, you will likely have about 16 GB to 64 GB of storage. Lack of space on your iPod Touch will prevent it from downloading data, apps and will make the device become sluggish. Generally, videos may occupy huge space on your iPod Touch. Clearing up video storage contributes a lot to saving your iPod Touch storage. Go to “Settings” on home screen of your iPod Touch. Select ‘General” tab and then go to “Usage”. Hit “Manage Storage” and the detailed storage about your iPod Touch will be listed there. You can check your iPod Touch video storage near the top of the list. In this era, you can go a step higher by using a third party software to manage your iPod Touch video storage. Manually checking and managing the video storage on your iPod Touch could be tasking and frustrating. However, using software is more efficient and easier to do. One of the best for this purpose is iMyFone Umate cleaner Windows /iMyFone Umate cleaner Mac. iMyFone Umate cleaner is capable of automatically detecting videos over 5 MB. This means that you do not need to bother about the size of your videos as the software detects them on its own. Besides, you can selectively mass delete them and keep the useful ones on your iPod Touch for daily use. It only requires you one click to delete the videos. 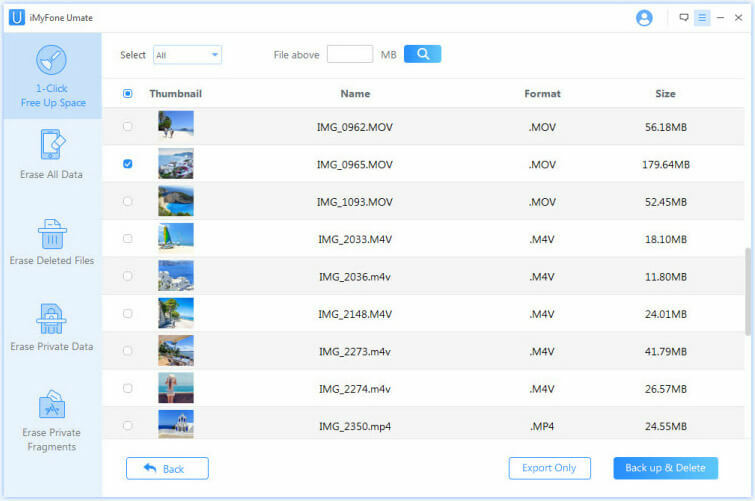 Apart from that, you can also choose the video files to remove according to different sizes of the files. 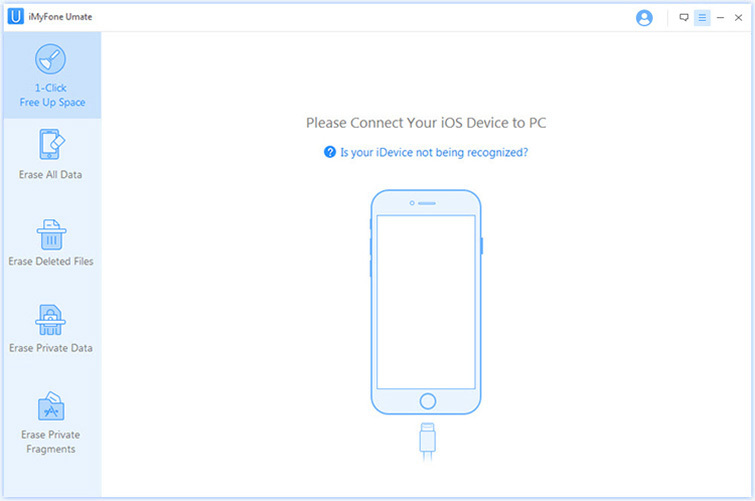 It is also important to note that you have the choice of backing up the selected files before deleting them from your iPod Touch. 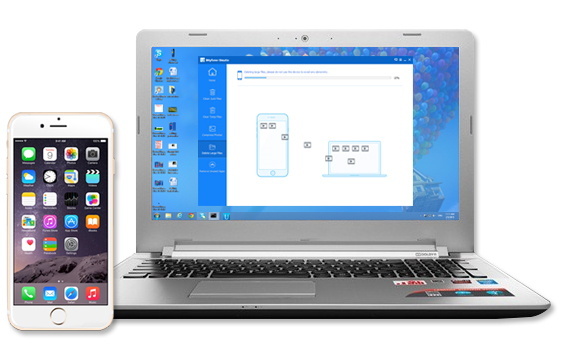 Step 1 Install iMyFone Umate cleaner in your PC or laptop, once installed, connect your iPod Touch to your PC or laptop. Step 2 Now, open the software and click on the Scan button for a full space-saving analysis. When the scan finishes, hit Clean button of Large Files and it will scan and find all the videos over 5MB. Step 3 Select videos you don’t want and click Back up & Delete. It will back up the selected videos first and then delete them. iMyFone Umate cleaner is a professional cleaner which works well for both Windows and Mac computer. It is regarded as the world’s No. 1 iPod Touch cleaner used to free up space for your iPod Touch, iPhone and iPad. It wins many reviews from a whole lot of iPod Touch, iPhone and iPad users. 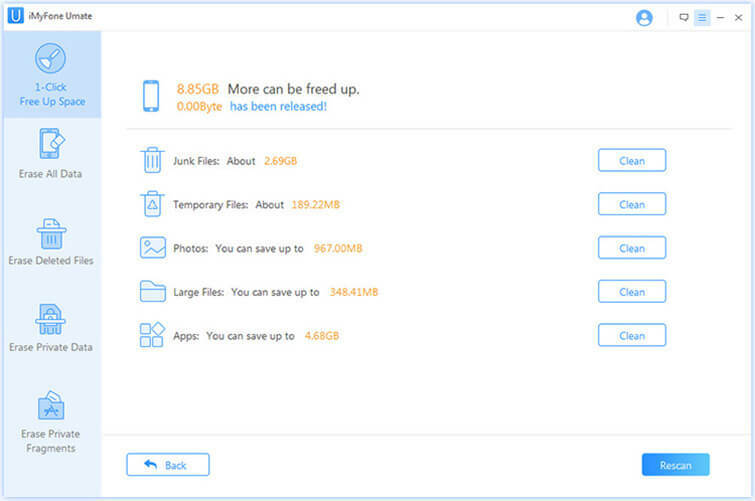 Apart from clearing up your iPod Touch video storage, iMyFone Umate cleaner still has other amazing functions which will help you free up tons of your iPod Touch storage with only one click. Clean as much as 30+ junk files, including caches, cookies, crash logs, corrupted files, etc. Thoroughly clear up temporary files produced when you use apps. Compress photos without losing the quality and at least save 75% photo space. Back up and remove large files, even do mass deletion according to different file sizes. Easily manage apps to free up more storage.